As I sit down to write today it is a beautiful Saturday afternoon in Charlotte, NC. I am sitting outside at Trade and Tryon which is the exact middle of the city, surrounded by tall buildings and beautiful waterfalls. There are people outside walking around; very happy, coming in and out of hotels, nice restaurants, and retail stores where they just purchased a brand new pocketbook or nice outfit for tonight's dinner out. It is amazing how well we live in America. Most people, including myself, have never been outside the country and know little about how good we have it. This past Tuesday I wrote an article titled, "The Future Problem Has Arrived." In it I described how the Chinese, have finally, finally, stopped buying United States treasuries and have actually begun selling in force. While many will view this as a disaster or "problem" as I described, it is actually the best possible thing that could happen. The United States over the next twenty years is going to experience a major decline in living standards across the board. Our prosperity as a nation peaked in October of 2007. There is nothing wrong with this, it is part of the natural cycle that has occurred throughout history. The UK experienced unmatched prosperity until the turn of the century in 1900, when the United States took over the role as the global leader. What concerned me up to this point was that China was refusing to acknowledge this transition and continued month after month to purchase United States debt, essentially throwing precious global resources down the toilet. If China continued to give the United States money, our leaders would continue to take that money and do very stupid things with it. This waste of precious global resources only hurts the entire global economy. I have used the analogy in the past of a spoiled child living off the allowance of a rich parent. The child will only change his ways once the free money had stopped, forcing him to grow up. This is the point we have now reached for our country. The foreign money has now stopped, and it should be time for America to restructure our economy based not on spending borrowed money, but savings and working to create an export driven economy that can be centered on the new wealth in Asia. That does not mean we have to build factories or cars. We could focus resources on technology or medicine such as cancer research. Exporting medicine and technology to Asia is just as good as sending cars or washing machines. This was the focus of Richard Duncan's latest book, "The Corruption of Capitalism," in which he said the United States has a brief window to take the correct actions before it went into terminal decline. Of course, as you know, we are doing the exact opposite. Our leaders are trying to re-flate the previous bubble economy that was based on borrowing and spending. Up until now they have done it with the world's global savings. This year they will begin to do it with a printing press. This does not change the final outcome for the country, it will just pro-long the change (maybe a year or two) and make it far, far, more painful. You will not see a revival of the middle class, it will simply disappear. We will see the greatest transfer of wealth in human history; wealth moving toward the currently wealthy that take action now to put their resources into hard assets such as commodities and precious metals. It will become a country of the ultra-rich and the poor, and it is very unfortunate because it does not have to be that way. 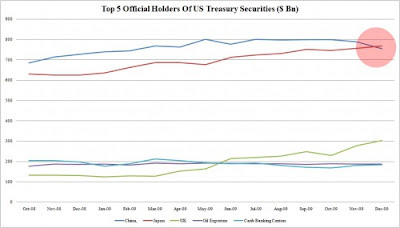 I think China's announcement this past week of the diversification of their holdings will end up becoming one of the most important story lines of this century, although it will not be recognized as such for a long time. We already see the ultra rich and legendary hedge funds taking their massive positions in the gold market. George Soros last month called gold the ultimate bubble. This week we received word that as he was speaking those word as he added a monstrous gold position to his hedge fund's holdings. His" bubble talk" allowed him to purchase the metal at a far greater price. The same goes for legends John Paulson and David Einhorn who have been quietly accumulating massive positions in the gold market over the last six months. It is laughable that Paulson, who made $15 billion in profit during 2007 shorting subprime debt, could not raise $90 million from the public for his new gold fund. The public will never, ever, come in until the very end. Human psychology will never change due to the lack of finacial education received at public schools in our country. Until we get to that end, I'm going to enjoy the rest of this beautiful afternoon here in Charlotte. I hope the weather stays nice all week, and I hope I am wrong about everything. Over the past few months we have heard "noise" coming from China that they are fed up with purchasing the astronomical United States debt load. Today we received the TIC data that confirms this is not rumor but fact. There is another interesting piece of information we received from the chart. When an entity purchases United States debt (treasury bonds) it is usually done through a primary dealer. There are 16 primary dealers that purchase debt at an auction and they then sell it into the market. Over the past 5 months there has been an unusual occurence in the auctions. An unknown "direct bidder" has entered the auctions, bypassed the primary dealers, and has been purchasing an enormous amount of the debt directly from the government. This bidder has remained anonymous and has create an inquiry around the web from financial nerds like myself on whose this bidder may be. Back to the chart above. As you can see the US debt holdings for the UK have exploded upward over the past two months with over $70 billion in new holdings. The UK is currently drowning in debt, just like the United States, so the likelihood of their government purchasing this quantity is very unrealistic. That means a hedge fund or private fund has purchased the debt through a UK address. This would provide an answer to the mysterious "direct" bidder that has entered the market over the past 5 months. Most of the financial nerds assumed this was China acting in secret, but with their recent debt dumping, it takes them off the list. Time will tell who is making the purchases. 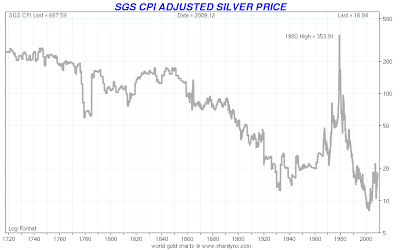 The following chart shows the inflation adjusted price for silver going back to 1720. As you can see we are just off the all time historical lows that we touched in 2000. Ironically this comes at a time when there is less above ground silver available than any time in previous history. Today there is currently 4 times LESS above ground silver available compared to gold. Either the supply is going to have to change rapidly (mine production is currently falling) or the price is going to have to correct upward in the future. Like we discussed here last weekend, it was just a matter of time until the Eurozone announced their bail out for Greece. We got the announcement that they would be saved this week. It is now safe to assume that with the Greek bail out every country will be bailed out down the line. That means that Portugal, Spain, Italy, etc., do not need to worry about cutting cost or balancing budgets. This is important news because the eurozone can now be considered one large bankrupt union just like the United States. So of course this begs the next question; If the United States needs to finance $1.7 trillion this year, the Eurozone needs to finance $1.3 trillion this year, and Japan is facing a funding crisis as well, who is going to buy all the debt to keep the global governments solvent? Can China buy this much debt? Not a chance. Under the best case scenario they could fund about $500 billion in global government debt. This assumes that they want to; all recent data shows China cutting back drastically on their government debt purchases. You’ve probably been hearing that there are some problems with the local state government’s budgets. So just how big is the problem? The following picture shows the 50 states of the USA. The dark red states show which ones are currently borrowing from the Federal Government every month to pay their unemployment claims. 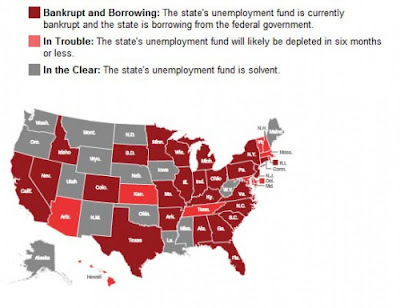 The lighter red states show which ones will be borrowing in six months or less to pay their unemployment claims. I have mentioned over the past few weeks that we are a country made up of Greek like bankrupt states, and this chart clearly shows that is the case. We have been in a 27 year bull market for treasury bonds. (Gov’t Debt) As recently as 1980, the government was paying an average interest rate on its debt of 10%. Today the interest rate on government debt is the lowest it’s been in history. Over the past year we have added an additional $1.5 trillion in debt to our total $13 trillion. During that period interest rates fell from an average of 2.6% to only 2.2%. Think of it like calling your bank for a credit line and the bank trying to determine how much to charge you for the loan in interest. This is Obama's interest payment. Please understand this Treasury bond market, not the NASDAQ market in the late 1990’s, not the real estate market during 2005, is the greatest bubble in world history. The following chart shows how much the yearly interest payments add to the total amount paid every year. Again, think of it like the yearly amount of interest you pay on your credit card bill. Look at the light green areas at the bottom of every yearly bar. A question I may pose is; what would happen if those interest rates rose from all-time record low levels to just something slightly more normal. What would this do to the total yearly cost to finance the deficit? If the average interest rate rose from 2.2% to just 3.2%, it would increase the yearly interest payments from $198 billion to $288 billion. A 67% increase. If the average interest rate rose from 2.2% to just 5%, it would increase the yearly interest payments from $198 billion to $450 billion. A 162% increase. If the average interest rate rose from 2.2% back to the 1980 levels of 10%, it would increase the yearly interest payments from $198 billion to $900 billion. A 424% increase. That would be an additional $700 billion we would have to add every year to the deficit. Could this happen again? Of course. Things are far, far, worse today than they were in the 1980’s. So if that is the case, why are interest rates not higher? Ah, there is the key question. 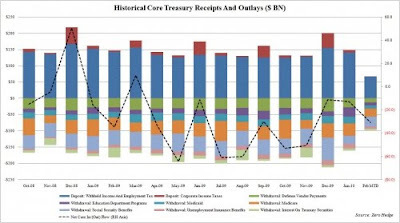 Last year the Federal Reserve printed 300 billion dollars and directly purchased treasury bonds. (Gov’t debt) They printed another 1.4 trillion dollars and purchased toxic mortgages. The vast majority of the people who sold them the mortgages then took that money and bought government debt. Both these programs end next month in March. If the Fed does not continue to purchase the debt, interest rates are going to rise significantly and the debt costs are going to rise to one of the scenarios I just described above. This is why I believe the Federal Reserve will continue to print money and buy the debt. Not doing so would make the payments instantly impossible to manage.